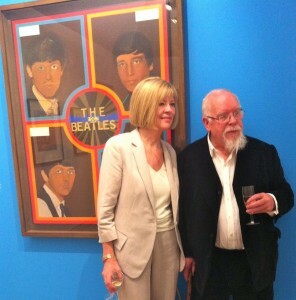 Sir Peter Blake was born in 1932 in Dartford, Kent. He studied at the Royal College of Art (1953-56) where he was taught by the illustrator Enid Marx and his contemporaries included Frank Auerbach and Bridget Riley. He later taught at the Royal College from 1964 to 1976, and has also at St Martin’s School of Art. During the 1960s Blake became well known as a British pop artists, famous for his 1967 album cover for the Beatles’ ‘Sergeant Pepper’s Lonely Hearts Club Band’. His paintings, which frequently used collage, included imagery from music posters and advertisements and often had a nostalgic element. He has also produced sculpture, engraving and prints, as well as commercial art including graphics and album covers. In the early 1970s Blake used watercolour to illustrate Lewis Carroll’s Through the Looking-Glass, and in 1975 was a founder of the Brotherhood of Ruralists alongside artists such as Graham Ovendon. He was made a Royal Academician in 1981. He had a major retrospective exhibition at the Tate Gallery in 1983 and was also made a CBE the same year. He was knighted in 2002. The last retrospective exhibition of Blake’s work, Peter Blake: Pop Music was held at Pallant House Gallery from 23rd June to 7th October 2012. The last major exhibition of works was held at Tate Liverpool in 2007.